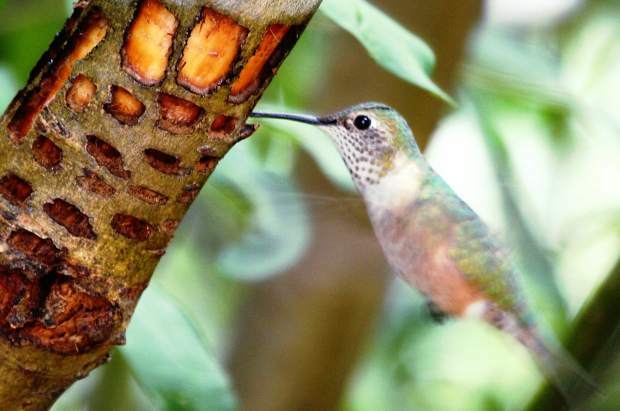 More than one species of bird benefits from a sapsucker's sapwell! The sapsucker is a type of woodpecker that notches rows of small holes in trees, causing sap to well out. The birds eat the sugary liquid flowing from these sapwells. 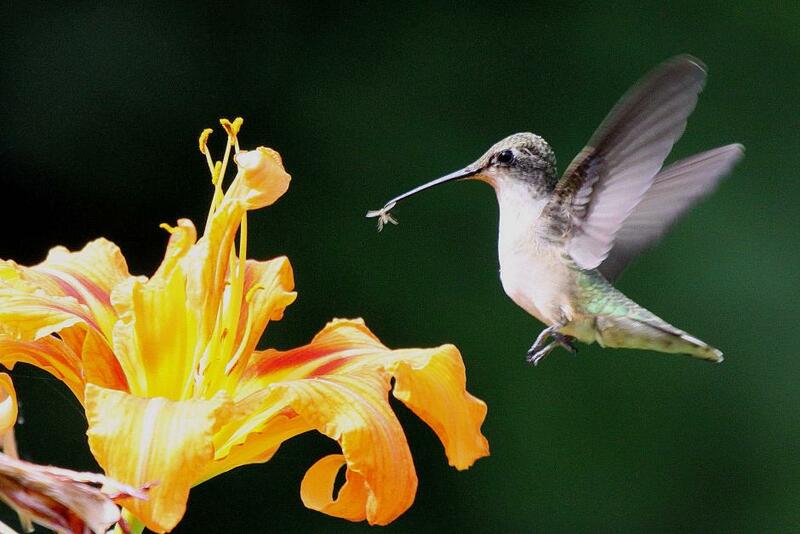 Tree sap is similar in sugar content to the nectar hummingbirds take from flowers. And it is no coincidence that just as the Yellow-bellied Sapsuckers get their sapwells flowing in spring, Ruby-throated Hummingbirds come migrating north. Several species of hummingbirds partake of the bounty of sap released by sapsuckers, even nesting close to active sapwells and following the sapsuckers as they fly from one sap tree to another. 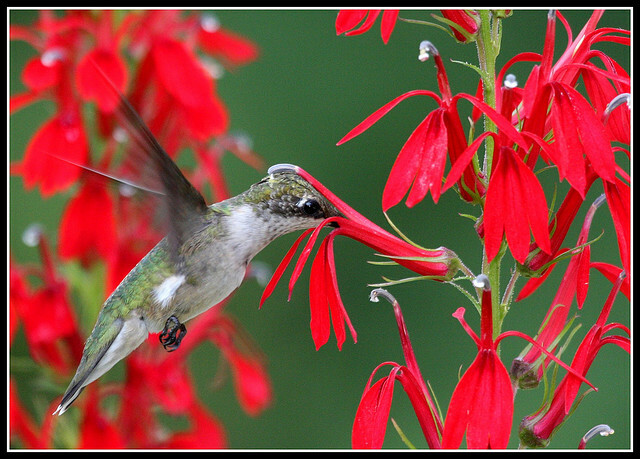 This female Broad-tailed Hummingbird sips at a sapwell in Colorado. When it comes to goofy bird names, there’s something irresistible about “Yellow-bellied Sapsucker.” But funny name and all, the Yellow-bellied Sapsucker is a real bird. [Drumming of Yellow-bellied Sapsucker] And its story tells us something fascinating about the timing of migration. Sapsuckers are a specialized group of woodpeckers that notch rows of small holes in trees, causing sap to well out. The birds eat the sugary liquid flowing from these sapwells. A remarkable connection between two very different birds, with a migratory pattern all set in motion by warming days, which get the sap running. Sounds of provided by The Macaulay Library of Natural Sounds at the Cornell Lab of Ornithology, Ithaca, New York. Call of Yellow-bellied Sapsucker 132198 recorded by G.F. Budney; drum of Yellow-bellied Sapsucker 133139 recorded by M. J. Anderson. Ruby-throated Hummingbird wing sound and call recorded by Martyn Stewart of naturesound.org.